Inside The Wonder Box: Eyebrows! I thought I haven't done a post on eyebrows yet..what a shame! Eyebrows frame the face, give it an expression and a finished groomed look. So here are my favourites! I've been in love with Paul & Joe in 02 for a few months now. The thing I absolutely adore about it is that it comes in the plastic retractable case, so you just twist it to get some more of the pencil, so that means no pencil sharpener, which is great, as I can never find mine, plus your pencil always stays sharp. Sadly, I almost used it all and when I wanted to re-order it from ASOS , it appeared that it was out of stock, so I was kinda forced to look for alternatives. 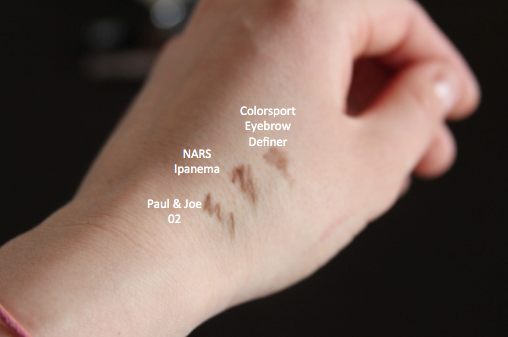 And this is when I came across NARS Ipanema, you can tell by the picture that it is almost identical to Paul & Joe one, but slightly browner and darker. Both of this pencils are of a brownish-grey shade, which in opinion, looks much more natural and nicer than a usual chocolate or dark brown pencil, which is very obvious in the natural light. The last but not the least is the ColorSport Eyebrow Definer, I got it from Boots while ago, it is like a thin marker, the formula is quite watery, but if you wish for a more intense colour you can apply a few layers. I find it is generally good for filling in any gaps in your brows, it looks natural and stays put amazingly well. What are your favourite eyebrow pencils?